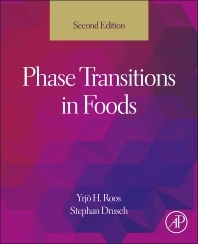 Phase Transitions in Foods, Second Edition, assembles the most recent research and theories on the topic, describing the phase and state transitions that affect technological properties of biological materials occurring in food processing and storage. It covers the role of water as a plasticizer, the effect of transitions on mechanical and chemical changes, and the application of modeling in predicting stability rates of change. The volume presents methods for detecting changes in the physical state and various techniques used to analyze phase behavior of biopolymers and food components. It should become a valuable resource for anyone involved with food engineering, processing, storage, and quality, as well as those working on related properties of pharmaceuticals and other biopolymers. Industrial researchers directly involved with food processing and product development, food science researchers and food science students (food engineering and food chemistry). Also of interest to agricultural and chemical engineers. Stephan Drusch is Professor for Food Technology and Food Material Science at the Technische Universita¨t Berlin. He studied at the University of Kiel (Diploma, PhD) and worked as a researcher in the dairy industry, at the University of Kiel and the University of Milan. His research activites focus on structure-function relationships in food processing with emphasis on dispersed systems and the encapsulation of food ingredients.